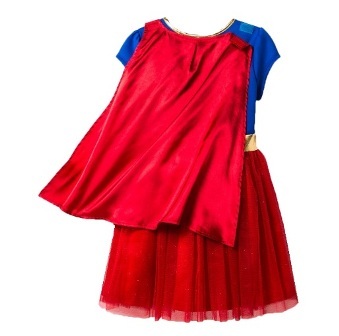 She'll feel all kinds of powerful when she wears this Supergirl Costume Dress. This costume dress comes complete with a sparkly tulle skirt, flowing cape and metallic gold accents at the waist and collar. Complete with Supergirl's logo on the front, she'll feel just like a hero when she's playing dress up at home or bringing her superpowers to school.